In keeping with our Red Valentines theme this month... we release another red themed app. Tonight, in our second release we bring you a second handy app that continues our commitment to the removal or the need for ANY dongles. A simple app that should likely make it into everyone's PS3 tool set. 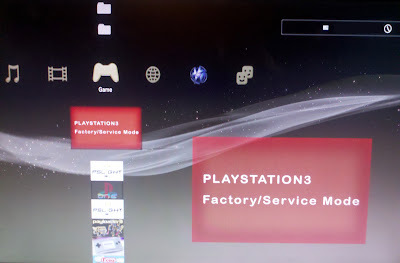 An XMB application that places the PS3 into factory service mode. Now, You can now throw away that downgrade dongle! Also, as an added bonus we've included CEX and DEX versions of the pkg. Psgrade was ported to all sorts of devices, even calculators ... none of those external devices are needed any longer! You may now re-purpose them! When you run the app it will beep once and reboot if successful. Three beeps indicates a failure, report the contents of factory.txt in this thread for help. (Factory.txt will save to the USB flash if you put on in the right most USB port of the PS3.) At this point you will come back up in Factory Service Mode (FSM). Place the Lv2Diag.self on the USB the Lv2diag.self will perform its intended purpose automatically. 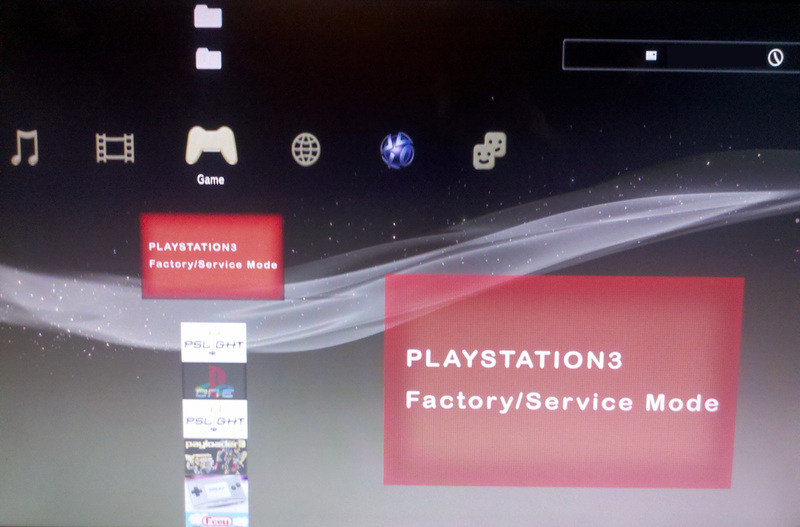 So be aware of that feature should you not be expecting the PS3 to boot back into the non-FSM XMB. This app will not work on any of the "reDRM" firmwares, aka Cobra or TrueBlue CFW. Install the appropriate pkg for your system; FactoryServiceMode.gnpdrm.pkg for CEX and FactoryServiceMode.pkg for DEX. Leave the USB Flash Drive in the PS3. Run the app and listen for the single beep, you should enter FSM automatically. Note: This release simply exits FSM. Do NOT use the RSOD Lv2Diag released earlier unless you have RSOD. Place the USB Flash Drive in the right most USB port of the PS3. Restart the PS3. When it boots up, you will be out of FSM. Enjoy sticking it to the dongle makers in your own little way. The app detects the firmware you are running on so it should work on all the firmwares supported by "one" previously. (3.15, 3.41, and 3.55. Basically, Ones that are lower than 3.56.) During creation of this tool, the open-source ps3toolchain, and a slightly modified make_self were utilized. All code is original and makes use of no previously released or copyrighted code, this Lv2diag.self is made 100% with the PSL1GHT SDK so it can be shared freely and without concern for breaking any laws in your country. So, "no sony code inside!" Q: Can I use this with the RSOD fix self you released earlier? A: You should only use the RSOD fix Lv2Diag.self to repair a RSOD PS3. Use the suplied Lv2diag.self packaged with this release to simply get out of service mode. Q: I'm having problems... help!!!!?!?!?!? A: Post the contents of the factory.txt, which is stored on the root of the USB flash drive where you put Lv2Diag.self, along with a detailed explanation and we will try to help you out. Without the contents of the factory.txt file... we will not be able to help. Q: Why didn't you just name the release .self file Lv2diag.self and save us a step? A: We intend to release more fun tools for you at some point, this just helps you keep them straight from the start. Q: It doesn't beep a single time for me, it beeps 3 times and goes back to the XMB. Can you help? A: We attempted to fixed this in the v.2 version of the app, ensure you have that one installed. If you do have that installed. Run the app a second time, without shutting down or restarting the PS3. Q: I see this, "ERROR: failed to read EPROM", in the factory.txt error log. Can you help? A: You likely heard 3 beeps. We attempted to fixed this in the v.2 version of the app, ensure you have that one installed. If you do have that installed. Run the app a second time, without shutting down or restarting the PS3. Q: I see this, "ERROR: SS EPROM read error returned: 1, product_mode: 0", in the factory.txt error log. Can you help? Q: I see this, "ERROR: LV1 mmap hvcall 114 not available:", in the factory.txt error log. Can you help? A: You likey have OFW (With Original PSJB Dongle even) or a reDRM Firmware. You will need to switch to a MFW to get this application to work. Q: I see this, "ERROR: LV2 poke syscall not available:", in the factory.txt error log. Can you help? Q: I get a 80010505 error in factory.txt on the USB drive sometimes. HELP!?!?! A: We noticed this on one Phat CECHG system in testing. but could not replicate it on other PS3's and it only occured after the initial run from a power on of the PS3. In this case, every time we ran it a second time the application worked with out fail. Try again and post the factory.txt if the problem persists. Q: Could you have made this just a little easier to use?